Cyclists from around town, the state, the country, and the world will soon have a continuous bike-friendly path stretching 73 miles down the scenic Columbia River Gorge. The trail is expected to be finished by fall, and will travel from Troutdale, OR to The Dalles, OR. The trail, named the Historic Columbia River Highway State Trail, will offer an amazing ride for cyclists from near and far. Cyclists looking to bike far out into the Columbia River Gorge will soon be one step closer their dream, as crews resume work on the much-anticipated Historic Columbia River Highway State Trail this winter. 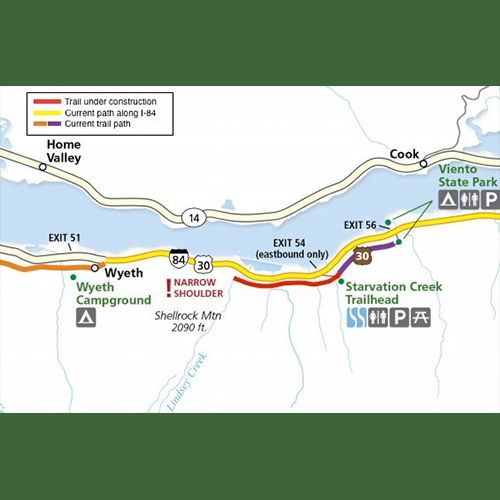 The 73-mile hiker and bike-friendly trail along the Columbia River Gorge will inch forward toward completion in 2016, as work begins on another piece of the puzzle that will eventually connect Troutdale to The Dalles. Crews first started work on the 1.3-mile connection between Lindsey Creek and Starvation Creek in December, but started ramping up efforts in late January, the Hood River News reported. The project – a collaboration between the Oregon Department of Transportation and other state and federal agencies – is expected to be finished by fall. It's a small portion of the sprawling bike-centric trail system that is attempting to replace the original Historic Columbia River Highway, the nation's first scenic highway dedicated in 1916, today connecting cities on the Oregon side of the Gorge along a whole different path. "You have a series of nice day trips which will become an international destination when they're all hooked together," former Hood River Mayor Arthur Babitz said in a promotional video series for the project. "When you connect all the pieces together, that's going to be transformational." Cities along the route hope the connection will bring more visitors, bringing an economic boost along with them. Cascade Locks was hooked up to the trail after the 2013 completion of the Bonneville Segment, between the city and John B. Yeon State Park to the west. For about a decade the town had flirted with a casino project, proposed by the Warm Springs Tribes, but now sees the trail project as a better opportunity. "There was a period when people thought a casino coming to town would change the dynamic," Tom Owens, head of the Cascade Locks Business Association, told the Oregonian in 2013. "We have moved beyond that and believe the tourism side of things is poised to take off in Cascade Locks." Only 10 miles remain unconnected on the Historic Columbia River Highway trail, all in a particularly tricky area between Wyeth and Hood River known to planners as the Mitchell Point Segment. There, the Oregon Department of Transportation and other agency officials will need to circumvent several obstacles as they weave a pathway between Interstate 84, the railroad line, and the rock walls that have stymied engineers since the 1910s. Chief among their challenges are bypassing Shellrock Mountain – which they plan to do with a trail behind the existing retaining wall – and building a 40-foot-high, 800-foot-long viaduct to connect Shellrock Mountain to Starvation Creek, via an old, unused segment of original highway known as Mossy Road. But even that will leave the project's biggest challenge of all in the way: blasting a new quarter-mile tunnel into the otherwise impassable Mitchell Point. The tunnel was built once before, considered a true feat of engineering that became one of the defining features of the old highway along the gorge, but it was destroyed in the 1960s during the construction of the interstate. The new tunnel, which would help crews connect the final five miles of the trail, isn't expected to be done until 2018. 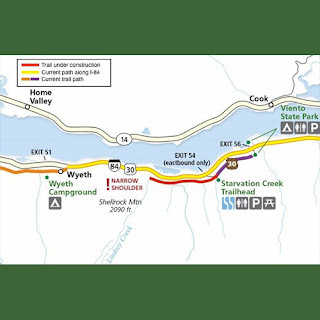 Until then, cyclists looking to tour the Gorge will have to take the risky incomplete route, a trip that requires biking the 10-mile stretch of the Mitchell Point Segment along the shoulder of busy Interstate 84. A bicycle tour of the gorge is surely an unforgettable experience, but you might just want to wait for the trail.